Join the discussion on our forums! Come discuss Fel Lord Betrug over in our dedicated Fel Lord Betrug discussion topic. Doomguard rotated because of this guy and Plot Twist. Did some experimenting. Watchers still can't attack if summoned with Betrug's effect. The "dies at end of turn" can be silenced, however, leaving the copies on the board at the end of the turn. "Betrug" is actually a German word and means "fraud". 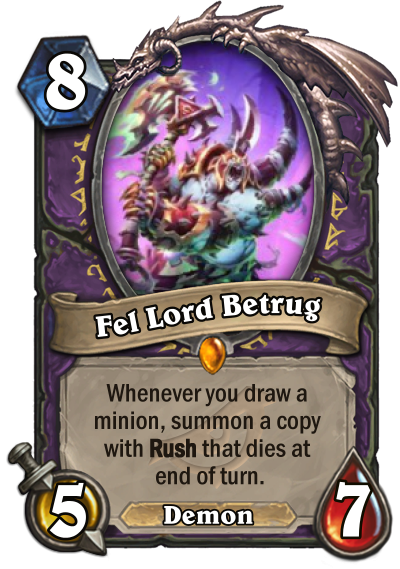 So his name actually is "Fel Lord Fraud". Plot Twist often lets you clear the board with this guy, so maybe 5/7 staying over is worth it in that situation. Yes!! Same thought, this is a totally explosive turn for a plot twist, plus if you a lot of deathrattle based minions or the Sapper in play, this is a pretty crazy card. So many different possibilities, and a board threat to boot. 7 mana, then 10 damage to face, board control and deathrattle effects for cost of mana.